The town of Frisco runs out on the east side into Lake Dillon, where you'll find a nice marina and great trails around the lake edge. Homes for sale in Frisco, here, between the lake and Summit Boulevard, are steps from this paved path through wetlands and wildflower fields.. Lake Point includes single family homes, duplexes, townhomes and a few small condo buildings. Charming in the winter, Lake Point is close to major arteries through Frisco and I-70 to Denver and the rest of the state. Take a look at the below Lake Point Real Estate Listings available now, or read on to learn more about this beautiful subdivision! There are several subdivisions on this side of Frisco, and homes for sale in this area will come in a variety of flavors. 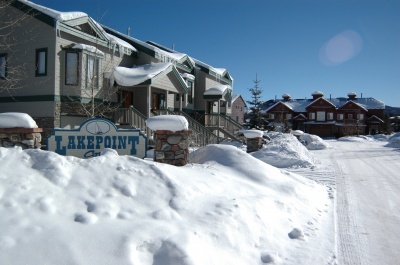 They include: Villas at Prospect Point, Prospect Point Townhomes, Raintree, Pointe at Lake Dillon BAy Club at Frisco, Mountain Meadows Condo, Timberline Cove Condos, Towers at Lakepoint Condos, Swing Crew Estates, Whitecaps Townhomes, Lakepoint (a few of each: sfhomes, townhomes duplexes and condos), commercial and residential Drake Landing, Tarn Landing, Meadow Creek Villa Condos, Lagoon Town Homes. If you are interested in learning more about the Frisco homes for sale, don't hesitate to contact Breckenridge Associates online or call (800) 774-7970 or (970) 453-2200 to consult a local real estate professional.